When making decisions about whether to digitize your company’s information, it’s easy to get lost in a sea of features and functionality and lose sight of the core reasons why you should consider information management software in the first place. Creating a central, digital repository allows your employees to access information anytime they need it, from wherever they happen to be. Cloud, mobile and web access technology have essentially erased the office boundaries, and version controls ensure that accessed information is current and up-to-date. Information management software also ensures that your information is only accessible to those who have permission to read or edit that information, and anti-tamper measures guard against outside threats. Furthermore, with a digital repository and backup storage, you have a cost-effective means of ensuring recovery, should disaster strike. With digital information, you can streamline approval processes and document processing. It also provides an easy way to manage retention schedules for regulated industries, in which different documents must be kept for varying lengths of time. High quality information management software includes audit trail features to aid in e-discovery situations, and top-of-the-line platforms are increasingly incorporating business analytics to keep you in touch with your company’s performance indicators. By giving your employees better access to information and the tools they need to streamline processes, you’ll wind up increasing their productivity. Reducing tedious administrative tasks and time spent looking for information results in more time for strategic tasks that help your company’s bottom line. Finally, with all that information at your fingertips, you’ll be able to promptly respond to your customers with the information they request and immediately react to changes in your company’s performance. 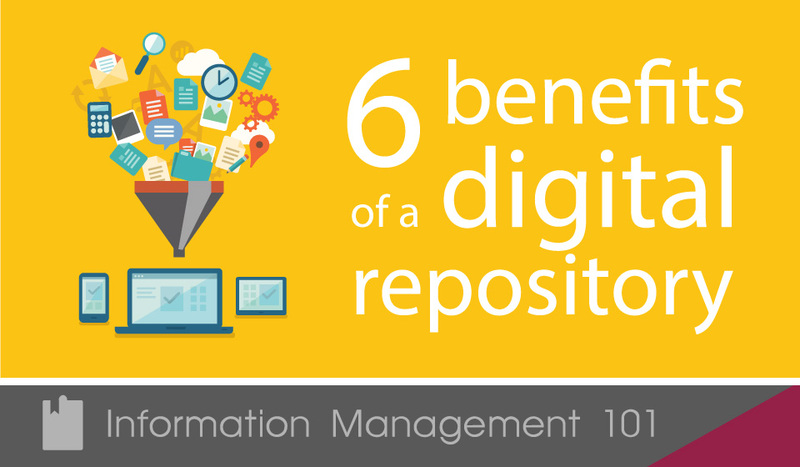 To put it all together, utilizing a digital repository enables you to transform information into a strategic asset – something that works for you rather than drains your resources. You’ll boost your productivity and remain agile and informed in a business world of constant flux.